Cavities don’t form all at once. In fact, they develop in different stages, progressing from minor to major over time. The team here at Windsor Dental Group is careful to diagnose and pinpoint the severity of a patient’s tooth decay, allowing us to use the proper restorative dentistry treatment to remedy the problem. 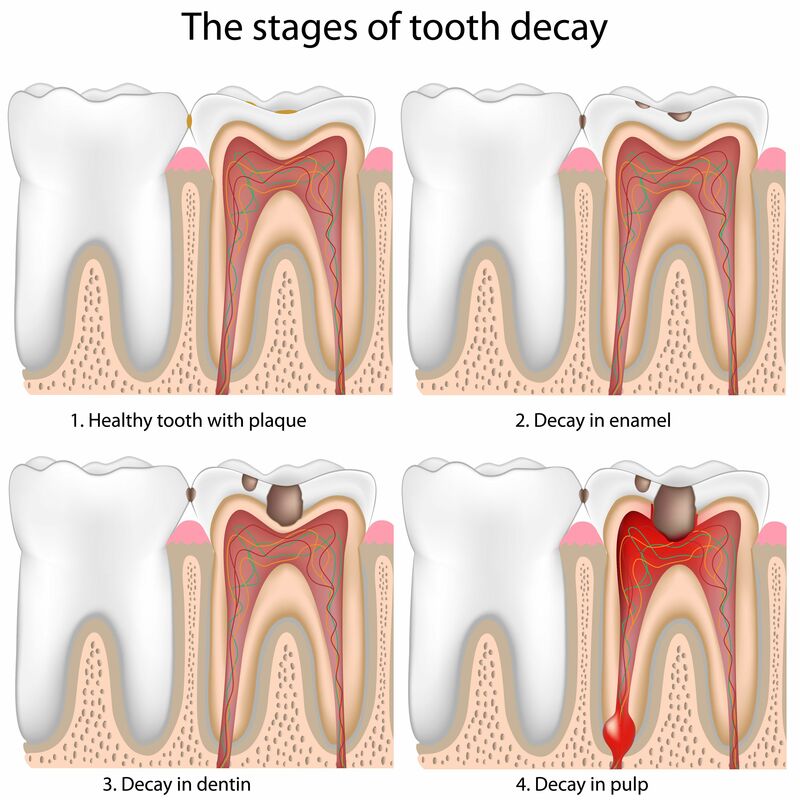 Let’s take a moment to consider the stages of tooth decay and what can be done to address these problems as they develop. The first stage of tooth decay indicates that demineralization has started to take place. This lesion does not show up as tooth decay in x-rays, but it’s a warning that a cavity is imminent. Typically these lesions are white or brown in color. Thankfully with early detection, the initial lesion can be addressed before it turns into a full cavity. Dentists may use fluoride treatment, dental sealants, and other procedures to prevent further progression. Patients can also help prevent the cavity from forming with attentive oral hygiene. Enamel decay occurs when the initial lesion goes unaddressed. This is a full-blown cavity, with part of the enamel layer of the tooth eaten away. Even a minor cavity can be serious, particularly if it’s untreated and is allowed to develop further. Treating enamel decay is relatively simple. The most common option for treatment is the use of a traditional dental filling. The filling will restore the damaged portion of the tooth, preventing the cavity from developing further and avoiding additional structural damage in the process. Beneath the enamel layer of the tooth is a substance known as dentin. The dentin is porous, which means that tooth decay can spread more rapidly through the dentin than the enamel. One of the most common signs of dentin decay is tooth sensitivity, especially when having hot/cold food items or beverages. When it comes to treating dentin decay, more substantial dental restorations are needed. This typically means inlays, onlays, or dental crowns. Like fillings, these restorations will help rebuild missing structure and strengthen the tooth in the process. Inside of every tooth is soft tissue known as dental pulp. This pulp is comprised of blood vessels, nerves, and connective tissue that was necessary for the initial formation of a tooth. If oral bacteria breaches the enamel and dentin and accesses the dental pulp, this leads to a root canal infection. Endodontic therapy is needed to treat a root canal infection. This involves removal of the infected dental pulp, filling the pulp chamber with an inert and sterile material, and capping the infected tooth with a dental crown. An abscess refers to an accumulation of pus that forms in response to an infection. Oral abscesses from infected teeth are especially dangerous. If an abscess bursts, it can cause severe infection and other major health problems. When an abscess forms in the mouth, it’s important that it be drained professionally. Antibiotics and antiseptic medications are common to help get the bacteria under control. A tooth may need to be extracted as part of this process given the structural damage that may have occurred prior to the abscess forming. If you would like to speak with a dentist about preventing and treating cavities, be sure to contact our advanced dentistry practice today. We look forward to your visit and discussing these matters in much greater detail.